Dynamic, energetic, poetic yet more fluent and somewhat less eclectic. STAMP AROUND continues the narrative of “Stamps from Bulgaria” – a series of compositions based on elements of Bulgarian folklore. 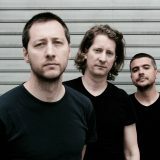 With this new a-la-suite approach the music takes surprising turns of sonic texture and emotion. 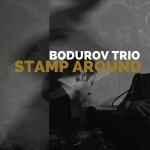 Bodurov Trio, led by the Bulgarian pianist and composer Dimitar Bodurov, has been in demand since September 2001. In November 2003, the band released their debut album ‘Melatonic’ ACR 9817, for the Norwegian label Acoustic Records, with exclusively own compositions, about which John Taylor commented: ‘A marvelous debut! ’. 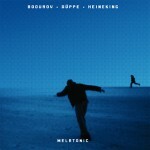 Their CD ‘Stamps from Bulgaria 2008’ was included in Volkskrant (NL) selection for top 10 CD albums from the Netherlands for 2008. 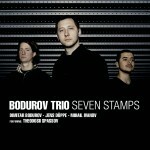 The bands latest album Seven Stamps will be released in January 2013 by Challenge Records and will be featuring the celebrated Bulgarian kaval player Theodosii Spassov. 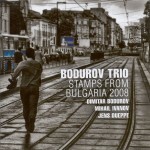 Bodurov’s fascination with Bulgarian folklore evolved in a unique and distinctive style, which is embodied in ‘The Resumption Suite’ 2004, a multi-partial piece for piano, bass, drums and samples, based on Bulgarian rhythms; then followed by the band’s successful project, ‘Stamps from Bulgaria’ – series of compositions based on traditional Bulgarian folk songs and dances. 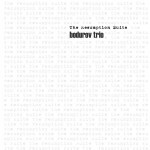 THE TRIO has been touring in the Netherlands, Belgium, Luxembourg, Germany, Austria and Bulgaria.